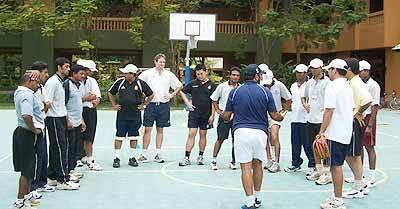 The one week course at Prem Center in Mae Rim was specifically aimed at wicket keeping, spin bowling and fielding. The theme was, “Being Balanced”. Representatives from the Asian cricket playing countries of: India, Sri Lanka, Bangladesh, Thailand, Singapore, Malaysia, Hong Kong, Nepal, Qatar, UAE, Oman and Maldives were in attendance. Ross Turner from Cricket Australia directed the course, with assistance from Graham House, Toot Byron, and Graham Manou, who took different coaching session during the six days. Dr. Vece Paes the ACC’s Consultant for Sports Medicine and Fitness was in attendance along with former Test and one day cricketers and ACC Development Officers; Iqbal Sikandar, Roger Binney, Rumesh Ratnayake, Ali Zia, CAT was represented by Mohindeer Kader, Peter Goodchap and local Puttivat “Parn” Poshanynondo from CMSCA CAT (Cricket Association of Thailand) together with CMSCA (Chiang Mai Schools Cricket Alliance) assisted in the smooth running of the course. This is the third Seminar held at the Prem Center, where the facilities are excellent The ACC is delighted at the success of the course and will schedule more Seminars in Chiang Mai. 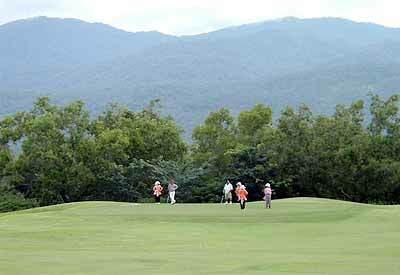 Golf under Doi Suthep mountain. Steve Polaski won last week’s Royal League competition at the Highlands Golf and Spa Resort in style, with a gross score of 78 shots and 39 stableford points. In moist conditions, he was sometimes hitting the ball over 300 yards off the tee, getting up and down from bunkers and holing out from all quarters of the green. 15th, the lad was up in two ­ 20 yards from the flagstick. Apart from Steve’s gross score, his back nine of 34 shots, including four birdies and two bogeys, and homeward run of 24 points were all Royal League records. This performance kept Steve at third in the Prize Winners List ­ an improvement over last year’s final placing of 8th. But it wasn’t enough to overhaul Ian Laidlow - currently listed second - who followed up his previous week’s win by coming in runner up this time out. After five top three finishes this term, Ian’s handicap has been chopped by 2 to 25, but that didn’t stop him from recording a worthy 35 points and proving yet again to be Grahame Curry’s nemesis. So, while Scott Stairs still tops the Prize Winners List, Last year’s Champ, Grahame, must stay content with 4th. More about the Royal League can be found on www.theroyalleague.com. For the first time ever Thailand will be hosting a Major International Cricket tournament. Under the auspices of the ACC 10 countries from the non-Test playing countries of Asia will be represented by their under 15 cricketers. One of the highlight will be the first appearance of a team from China on the International cricket scene. This should create further interest in cricket in Thailand. Matches will be played at 4 different venues, 2 in Bangkok and 2 in Chiang Mai. Locally the Chiang Mai Gymkhana Club and Prem Center will each host series of games over nine days leading up to the finals. The fact that there will be turf wicket available for cricket to be played on is a huge step forward for cricket in this region. There will be considerable interest in which of the local boys will be representing Thailand again. There is a possibility of up to six local boys being selected for the team. Their selection will depend on their own dedication to training and attitude in developing their own personal cricket skills. Four of the boys performed very well in Bangkok during an under 15 tournament in May so have signaled that they are ready for bigger challenges. In preparation there will be a three team tournament will be played in Chiang Mai in November to sharpen up the eligible Thai players and give the selectors a good chance to see the players under some pressure. 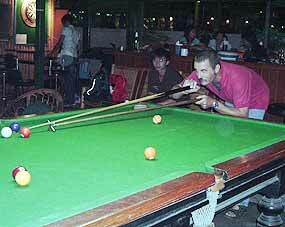 Thailand is keen to show that its recent improvement has not been a one off and wants to continue its winning way. Blue Sky Bob taking a rest in the Garden. On to last week’s League action, when Friend’s Corner and Half Moon Pub both took a point with 5-4 wins to stay joint leaders. In a ding-dong battle at Friend’s, scores were level at the interval and all square at 4-4 before The Corner managed to edge December Bar. Unfortunately the match was marred by suggestions that Friend’s had used excessive gamesmanship, especially in the deciding frame, and the match concluded in a somewhat unfriendly atmosphere. 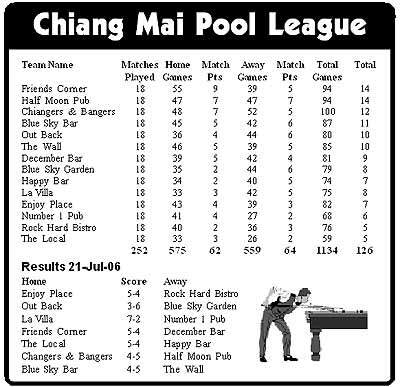 At Chiangers and Bangers, Half Moon Pub was chasing the game by trailing 0-2, 1-3 and 2-4 during the singles. But fortunes changed hands in the first doubles. Chiangers sank a stripe on the break, but on potting the next one, knocked the black in by mistake to lose the frame without The Moon having taken a shot. At 4-4, up stepped Ron the “The Gloved Gladiator”, to polish off the final three balls and keep The Moon in high orbit. There was just as much excitement at Blue Sky Bar, where the home side’s young star Willy began a promising clearance that would have won the deciding frame. But an unfortunate foul on his last ball handed The Wall with the simplest of blacks, and the match. These results meant that the first four League positions remained unchanged, but The Wall moved into 5th above Out Back, who suffered a 3-6 home defeat from Blue Sky Garden. In the second half of the table, Number 1 Pub got off to a bright start at La Villa by winning the first frame, but that only fired the Pizza Boys into action and the latter swallowed up the next five games. The home side then took two of the doubles to round off a topping performance. Enjoy Place will be mighty relieved to end their nine match losing streak with a 5-4 home win against Rock Hard Bistro. In a closely fought contest, games were level at the break, but Enjoy took the first two doubles to make sure of the point. Rock Hard have now lost 10 of their last 11 matches - seven of those by the odd frame. And last week’s result put them in the League’s basement, on level points with The Local, who squeezed past Happy Bar at home. Happy took the first doubles frame to move into a 4-3 lead, but The Local countered to force a tactically fought decider, in which Pla knocked in the black to give the home side victory.